Matching Dragoons: Hex #2 "Can She Bake a Cherry Pie?" Hex #2 "Can She Bake a Cherry Pie?" "Can She Bake a Cherry Pie?" Two large US Army helicopters fly over the Viet Nam jungles in the 1960's. Several of the grunts inside are talking about several topics but mostly we get to know Winslow, the folksong playing soldier who has his guitar with him, Harris the angry black man, and Berkowitz the book nerd who is reading about wild west gunfighting. Suddenly a large blinding light appears in the sky and the lead helicopter vanishes into it. The second chopper (with our aforementioned soldiers) is also drawn into the light and suddenly appears directly above Jonah Hex on his motorcycle. The pilots are unable to regain control of the helicopter and they crash in the Washington state desert. Two technicians that work for Reinhold Borsten see everything on a large viewscreen and notify Borsten of the accident. It seems that they inadvertantly captured two helicopters from the past instead of one. 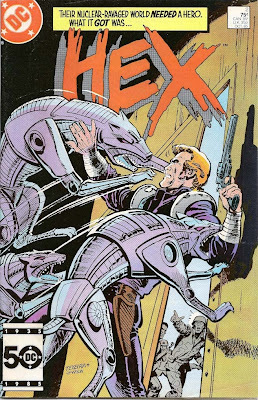 As they are displaying the scene of the wreckage, Borsten notices that Jonah Hex is on the scene and he orders that Hex be brought back to him. At the crash site, Jonah has pulled several soldiers from the rubble. He is about to rescue some more when Harris tells him to stay back since the fuel tanks might explode. It just so happens that the three soldiers that we met are the only three to survive. Berkowitz introduces everyone but Harris isn't about to play nice nice with a white guy from the South. When Hex introduces himself, Berkowitz recognizes the name but doesn't say anything. Jonah quickly tells his story and tells them that they are outside Seattle but just then three huge rolling battle wheels come over the hill. The machine guns that our boys are carrying do no good against the wheels, but Jonah realizes that there is a small slit in the firing dome and three slugs later there are three dead battle wheel drivers. Hex and the boys are able to commandeer one of the battle wheels (the other having crashed) and they take off across the wasteland. Meanwhile, back at the 'Needle', Borsten is chewing out his lead commander for having failed to bring in Jonah Hex. Borsten will hear none of the commanders excuses but instead demands that 'the girl' be brought in. A woman walks in from the shadows and Borsten explains that he has a job for her and then we learn that she is STILETTA!!! Several hours later, Hex is on his cycle with Berkowitz and Harris and Winslow are in the battle wheel. during the ride, Berkowitz verifies with Jonah that he disappeared in 1875 (LIAR!!!!). They finally decide that they are all in the future and that Borsten has the means to get them all home. They decide that they will need some bigger firepower to get in. Winslow's father worked at a secret base outside Seattle, so they head that way, hoping there might be something leftover that they can use. They finally show up at the base and start searching some of the remaining buildings when they hear some growling. They turn and discover that the base is still guarded by robots dogs with friggin' lasers on their shoulders!!! The robo-hounds shrug off normal firepower so Harris lobs a grenade and takes out one. Jonah leads another hound to a weak spot in the floor so that it falls through, but there is no way to stop the third one. The three Army men are trying to open a door at the end of the corridor and Hex attempts to slow down the robo-hound. The guys get the door open and are holding it for Hex but Jonah realizes that the dog is too close, if Hex gets inside the door, the hound will too. Jonah runs to the door and slams it shutting, turning to face the dog himself. Later we find the Army guys working on some sort of hovercraft that they have found and they are discussing Hex. Harris still ain't convinced that Jonah is nothing but a Confederate racist. Meanwhile, Jonah and Stiletta are outside the building making up for lost time. Shortly they have the hovercraft functional but they still haven't solved the problem of getting inside the Needle. Stiletta explains that she can get them in, she knows the Needle like the palm of her hand. They do manage to get to the Needle and get in with no problem. Stiletta explains that there will be few guards at this time of night. Stiletta tells Hex and Harris to guard the rear while Winslow and Berkowitz follow Stiletta, who is taking point. As they are walking, we see a control room with Borsten watching a large screen that provides Stiletta's point of view. Of course, Hex knocks the bejeezus outta Harris but then Harris walks over to Stiletta's corpse, reaches into her skull and pulls out her eye...her CAMERA EYE!! Harris explains that she is a robot and this whole thing is a setup. Borsten sends in the troops to capture Hex and a huge gunfight ensues. Jonah starts to head down the corridor when he hears troops trying to outflank them but then an electric net springs up between him and Harris. Jonah manages to jump out of a window and commandeer another motorcycle, leaving Borsten's screams being heard throughout the Needle. Timeline - This one starts immediately after last issue. Hex and the guys spend a night in the Army base and it appears to be dawn when Jonah leaves the Needle (but I doubt that). We'll just call this a day and that night. Jonah has been in the future for one whole day!! I really enjoyed this issue. I loved Texeira's work with the forced perspective and the way he used the panels at times I could almost feel camera movement. It started expanding the supporting cast around Hex and it showed that folks were going to die in this book and that we can't really trust everything we see (Stiletta a ROBOT?!?!?). 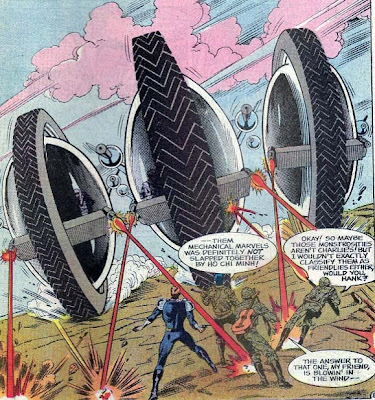 The robot dogs and the War Wheels were kinds trite (Blackhawk fought War Wheels!) but all in all this is great fun (despite Harris being an 'angry Black man'). I especially liked Stiletta standing there saying "Did'ja miss me, tiger?" like some punk-future Mary Jane Watson. Next Issue: Jonah takes on the drug dealers and gets beat up by a guy named BLOSSOM!!!! 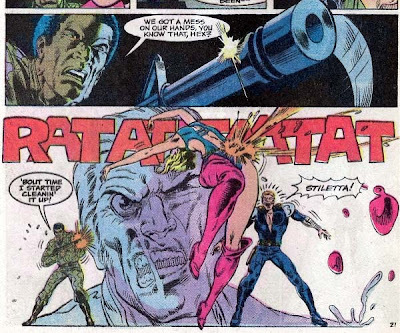 I'm afraid I'm still struggling with the whole idea of Jonah being in the future -- I always thought that was more than a little goofy, though Fleisher is a good writer. Fleisher has said himself that he didn't enjot writing Sci-fi, so I have to give him credit for doing as good a job as he is.